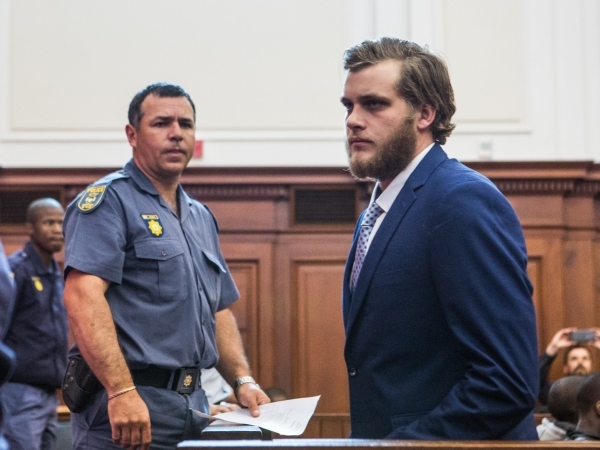 Two years after his parents and brother were killed with an axe, Henri van Breda will go on trial in the Western Cape High Court on Monday. He is charged with three counts of murder, one of attempted murder, and one of obstructing the course of justice. Van Breda was arrested 17 months after his parents, Martin, 54, and Teresa, 55, and his brother Rudi, 22, were killed in their home on the luxury De Zalze golf estate in Stellenbosch in the early hours of Tuesday, January 27, 2015. His sister Marli, 16, survived. Here is a timeline of what the State alleges happened before and after the attack, as well as how the story developed in the build-up to his trial. Raised voices are heard that evening, coming from the Van Breda home at 12 Goske Street, situated at the centre of high-security estate. 4:24 – Henri phones his then girlfriend. She does not answer. 4:27 – Cellphone records show he Googled emergency numbers. 7:12 – Henri makes a number of cellphone calls to emergency services. 7:15 – Police and emergency services arrive at the Van Breda home. Martin, Teresa and Rudi are declared dead at the scene. Marli is rushed to hospital with life-threatening injuries. An axe – believed to be the murder weapon – and kitchen knife are found on the scene. Both belong to the Van Bredas. Henri is found wearing blood-stained sleeping shorts and white socks. He sustained superficial wounds. No sign of forced entry is found and nothing is missing from the home. 7:38 – Henri phones and reaches his girlfriend. Later that day – He is taken in for questioning. Reports emerge that Marli has started speaking while in hospital under police guard. She suffered a severed jugular and severe head injuries. She has retrograde amnesia. Allegations of Henri’s involvement in the murders are published in the Sunday Times. It is reported that he phoned paramedics four hours after initially doing a Google search of emergency numbers and that his wounds were possibly self-inflicted. The Sunday Times reports that Henri is believed to have a tik addiction. A drug runner named Mark identified him from a photo as being a regular customer. Police are reportedly investigating a number of possible motives, including that Henri’s parents cut off his allowance. The National Prosecuting Authority confirms it has received the murder docket for the attack for a decision. It is sent back to investigators. Marli is released from Vergelegen Medi-Clinic after nearly six weeks to continue her recovery at a rehabilitation centre where she receives occupational and physical therapy. Marli returns to school full-time and is doing “extremely well”, her curator advocate Louise Buikman says.Her classmates write exams while she receives specialised tutoring to help her catch up.The then 16-year-old receives therapy and counselling, although the intensity lessened after her return to school. Marli and Henri see each other again for the first time in five months. Buikman says Marli is “happy” to see her brother. The Western Cape High Court orders Marli be placed in the care of an uncle and aunt. The court orders that the teenager not be photographed or interviewed without Buikman’s consent. Teresa’s sister Narita du Toit tells YOU magazine that Henri is a “lovely child” and would never attack his family. She denies rumours that Henri was on drugs or had been in rehabilitation and a psychiatric clinic. Henri and his lawyer Lorinda van Niekerk report to the Stellenbosch police station on instruction from authorities. He is arrested and spends the night in the holding cells. Henri appears in the Stellenbosch Magistrate’s Court. Magistrate Lungelo Jumba says it is clear there is no likelihood that he will flee or interfere with witnesses and grants him R100 000 bail. Table View police arrest Henri and his girlfriend Danielle Janse van Rensburg for alleged dagga possession.Henri is held overnight and granted bail of R1 000. Janse van Rensburg is released on R200 bail. She reportedly claims the dagga belonged to her. Henri appears in the Western Cape High Court for his first pre-trial conference. The State says forensic reports, including DNA evidence and computer data, are still outstanding.Before his appearance, a copy of the docket is stolen from his lawyer’s car in Green Point. Lorinda van Niekerk tells News24 that a laptop and two bags were stolen from her car. Her cellphone and wallet were left behind. Henri appears for his second pre-trial hearing no longer sporting his beard.Proceedings are postponed as the State says it needs to provide all the particulars of their case to the defence for its own expert analysis. All pre-trial steps are completed and a trial date is secured.